Hi everyone! Before I tell you about my challenge piece today, I want to apologize for being AWOL from the blog this week. Since we got back from Michigan we have simply not stopped and life has been really nuts in our home. Nothing serious, praise God, but just very full days and evenings. I hate not posting, but when there is only so much time and so much of me to go around, something had to give. On the bright side, I do have a lot of projects that will get posted soon, I promise! And Tiffany if you are reading this - THANK YOU for the blog award! You are the best! I'll post it next week with my pass along choices, ok? Whew, now that I've gotten that off my heart, let me share my ornament with you! This actually is one of the projects from my Procrastinator's Gifts classes this week. Yesterday's group loved it and I hope you will too! It's pretty simple actually. Just stamp your images with Staz-On ink onto a piece of acetate cut to fit the circumference of your hollow glass ball. Cut a little tab at the top so it stands up in the neck of the ball to hold it in place. For this one, I used the stamps from Winter Post and stamped with White and Black Staz-On inks. As they dried for about 5 minutes, I cut an exact size circle with my Coluzzle out of the now retired Bashful Blue Prints Paper pack. The edges were sponged with Chocolate Chip ink to age it a bit. Then I used two Mini Glue Dots to attach the paper to the acetate, hiding them behind the snowflakes. This was then rolled up tight in a tube, paper on the OUTSIDE and slipped into the neck of the ball. The acetate layer will pop out, but you will need to insert a long thin object into the ball to flatten out the paper layer so it all stands straight. I used the end of the Coluzzle knife, but just make sure the cap is on! To make the snow, I added about a teaspoon of Chunky Glitter in Clear through a funnel into the ball. The cap was added and then shaken a bit to make it stick to the sides a little. For the finishing touch, I cut 5" pieces of the Alpine Felt ribbon and Bashful Blue Taffeta ribbon and single knotted them through the top. Silver Cord was used for hanging it. I hope you like this fun project! If you wish, you can shop for the supplies to create it yourself from my website HERE. Simply click on the SHOP NOW button and start shopping! Did you know that any order over $70 through the 23rd of December earns you FREE SHIPPING? Yes, it does! That's very cool! After you are done shopping, take a minute and check out all the other Blogger's Challenge players by using the link on my sidebar. I know they will have great inspiration for you as well. Very pretty! Great idea to back the acetate with DSP! Love the vintage look and feel of this ornament. Great job! Beautiful...such a wonderful image for this type of ornament. Great job with the challenge. Beautiful Robin! Hope Emma has a wonderful Birthday! 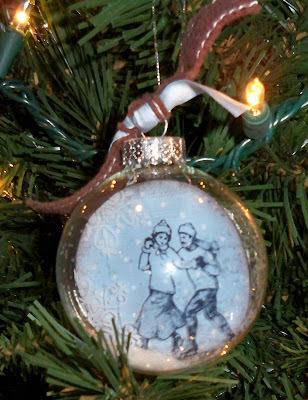 I have not made one of these kinds of ornaments! They are really beautiful and I love yours! TFS! VERY cute! I love how you've layered DSP behind the acetate! This is beautiful!! Great job with the challenge! These ornaments are so much fun to make. I've never tried it with the DSP behind it. So pretty girlfriend!!!! This is so pretty, Robin! VERY pretty ornament...I love the skaters from Winter Post and how you backed the acetate with DSP...brilliant! It's a winner, Robin! Love the addition of the DSP to make it pop out more! Clever idea, and it turned out perfect! Great image for this type of ornament. So pretty. Very pretty. What a popular image this week and each one looks so different.